As a Microbiology QC Supervisor at Genesis Biosciences, Nadia Meghjani uses her scientific expertise and attention to detail to ensure that our products meet our high quality control standards every single time. 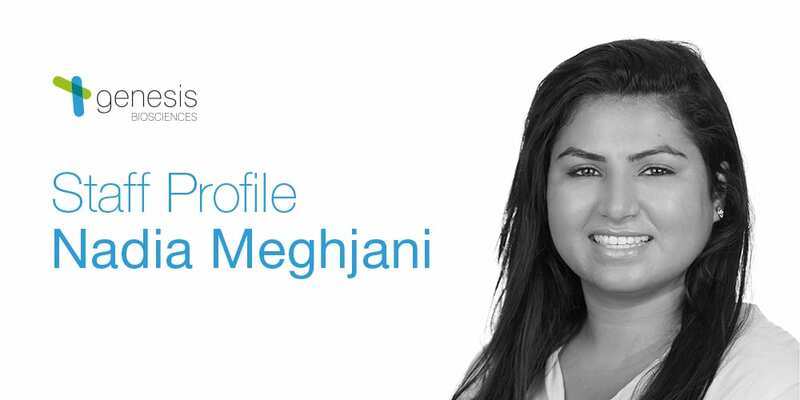 As a microbiologist, Nadia Meghjani has a good eye for meticulous details – making her a perfect fit for the role of Microbiology QC Supervisor where she’s in charge of performing checks regularly on our products. As a company that prides itself on our ability to show the benefit of our products with proven scientific data, Nadia is on hand to help our customers if they have any technical questions about how our products work and how they can meet their specific needs. Nadia also has a long history of commitment to environmental issues, having undertaken academic research on topics such as mycological specimens in North Georgia and the development of green technology fish bait. As Microbiology QC supervisor, my role involves checking our fermented powder throughout its whole process and conducting validation check points to ensure we produce a high quality product. I also use my microbiology expertise in the technical department to assist our customers with any questions or concerns they may have. 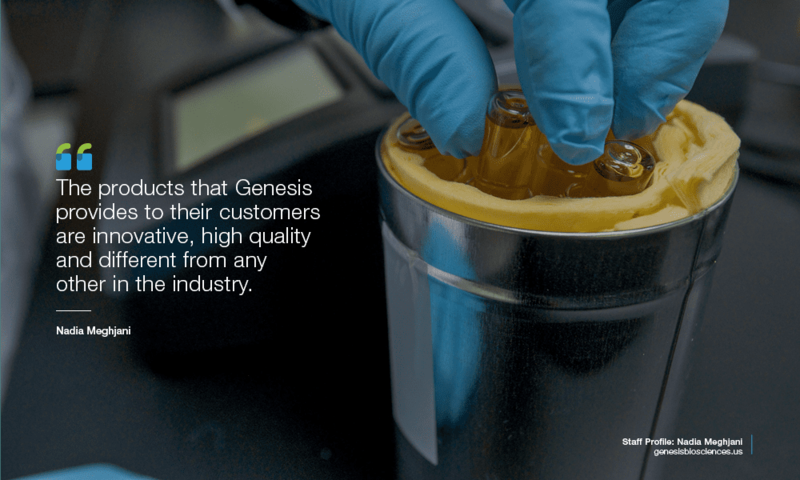 The products that Genesis provides to their customers are innovative, high quality and different from any other in the industry. The niche that Genesis has dominated is creative, eco-friendly and a forward thinking idea which aligns with my values. What’s the best thing about working as a Microbiology QC Supervisor at Genesis? Genesis provides a family-like atmosphere. I can talk about my ideas with anyone across the board or authority level. They are always open to hearing new ideas or suggestions that can improve our work environment and the quality of our products. Everyday brings a new situation and perspective to the table, but the most consistent task is to ensure the purity and the quality of our product is higher than the industry standard. We take our samples through extensive and rigorous testing to ensure no pathogens are present, that our spore counts meet specification and that our product is aesthetically presentable. The process is double and tripled checked, from the time it is produced to its packaging. As a Microbiologist, it is hard to convince an audience of how important and beneficial our bacteria can be. Other companies may exaggerate or downplay what Bacillus bacterium can do and that can be difficult to overcome. Fortunately Genesis is all about experimenting and validating. 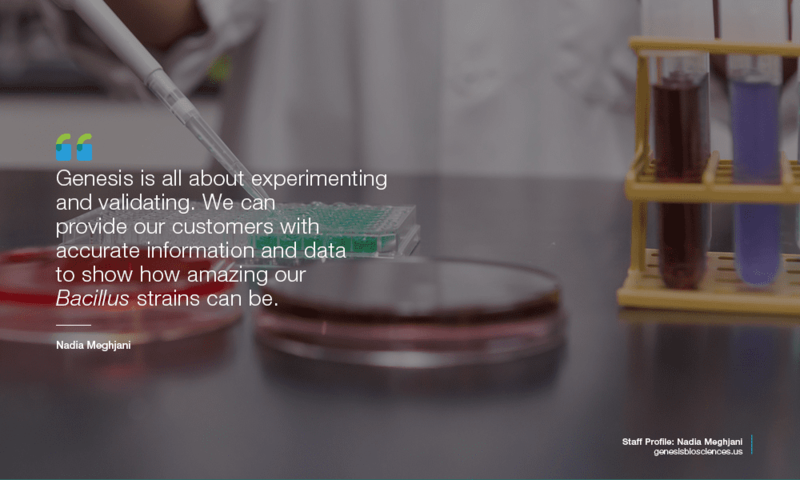 We can provide our customers with accurate information and data to show how amazing our Bacillus strains can be and how they can be used for both broad and specific applications. To be a leader you need to be able to communicate and have a great work ethic. My job as Microbiology QC Supervisor requires someone to be detail oriented and vigilant about the process. There are numerous processes going on simultaneously and it is imperative to follow our standard operations thoroughly and in a timely manner. 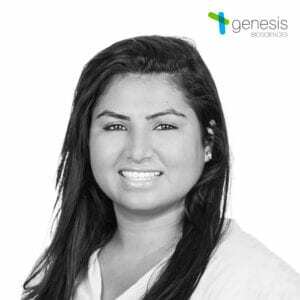 Genesis has provided me with great opportunities – not only to learn new skill sets but also to explore my out-of-the-box thinking. With the support and open mindedness of the company, I have been able to show my knowledge and was promoted to Microbiology QC Supervisor. I hope as the company grows, that I can be an integral part of their process. I would love to continue to be a growing part of a company that is booming with an eco-benign® mentality and commitment to making a difference in the world we live in. To find out more about the work of Nadia Meghjani and Genesis Biosciences, visit our About page.